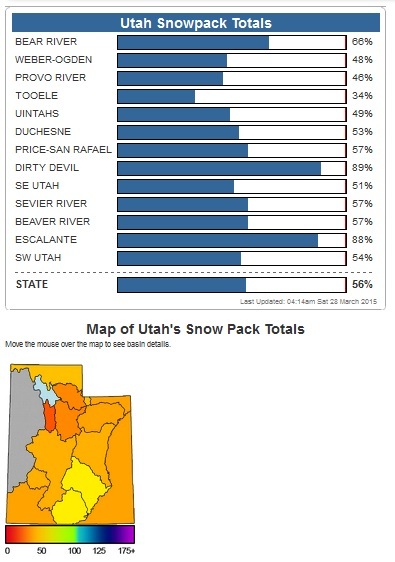 The above statement by Weber Basin Water is confirmed by the following snowpack report, last updated Saturday, Mar 28, 2015. Two modern prophets, Spencer W. Kimball and Gordon B. Hinckley, have pointed to Sabbath observance as the cure for drought. "Early this year when drouth conditions seemed to be developing in the West, the cold and hardships in the East, with varying weather situations all over the world, we felt to ask the members of the Church to join in fasting and prayer, asking the Lord for moisture where it was so vital and for a cessation of the difficult conditions elsewhere. "Perhaps we may have been unworthy in asking for these greatest blessings, but we do not wish to frantically approach the matter but merely call it to the attention of our Lord and then spend our energy to put our lives in harmony. "'Then I will give you rain in due season, and the land shall yield her increase, and the trees of the field shall yield their fruit. "'And your threshing shall reach into the vintage, and the vintage shall reach unto the sowing time; and ye shall eat your bread to the full, and dwell in your land safely. "Innumerous times we have quoted this, asking our people not to profane the Sabbath; and yet we see numerous cars lined up at merchandise stores on the Sabbath day, and places of amusement crowded, and we wonder. "'Remember the Sabbath day, to keep it holy. "But today numerous of the people of this land spend the Sabbath working, devoting the day to the beaches, to entertainment, to shows, to their weekly purchases. Tracts of newer housing are scattered around the cropland and cattle pastures of Eagle Mountain and the surrounding Cedar Valley. Population growth in the past five years has been so substantial that two stakes of the Church now bear the name Eagle Mountain. Perhaps it was natural that President Hinckley would touch on the five-year drought that has afflicted Utah and revisit a theme he spoke on at general conference. "I think the Lord is trying us a little," he said. He quoted Leviticus 26:3-6, which promises, "If ye walk in my statutes, and keep my commandments and do them; Then I will give you rain in due season." "What a magnificent promise," he exclaimed and added that as he traveled to the stake center that morning, "I looked at the store parking lots that were filling on the Sabbath day. I looked at the farms that were being tilled on the Sabbath day. I looked at some of the other activities that were going forth on the Sabbath day, and I said to myself, maybe the Lord is reminding us that we need to draw closer to Him and be more true and faithful and deserving of His great and good and marvelous blessings." He went on to quote from Solomon's temple dedication: "When heaven is shut up and there is no rain because they have sinned against thee, if they pray toward this place and confess thy hand and turn from their sin when thou dost afflict them; Then hear thou from heaven, and forgive the sin of thy servants" (2 Chronicles 6:26-27). "I believe, my brothers and sisters, that the Lord is reminding us that we ought to be more faithful," President Hinckley said. "We ought to be more diligent. We ought to draw closer to Him. We ought to be more anxious to keep His commandments and do His divine will."